Looking for a modern home near Sunset Junction? 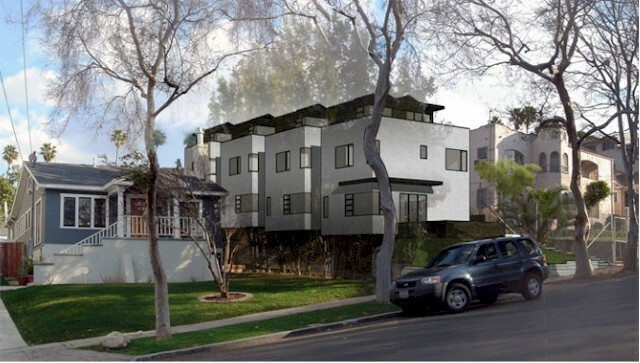 Green City Building Co has put the small lot subdivision ordinance to good use with 4 new homes on Edgecliffe Drive in Silver Lake. 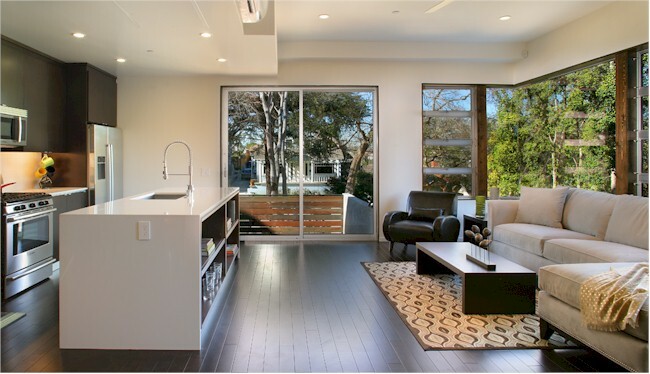 Green City built these 4 Silver Lake homes as a “Modern interpretation of mid-century modern Aesthetic”. Basically we are talking about cool new homes with corner glass windows, bi-fold exterior doors and steel exterior accents. The homes are eco-friendly with, passive solar orientation & thermal chimneys, solar electric systems, tankless water heaters, and low & no-voc finishes. VOC stands for ‘volatile organic compounds’ which continue to release toxic emissions into the air for years after application. Obviously, the lower the VOC, the better for the environment. These homes also include energy star appliances and pre-wiring for electric car charging – how’s that for green building?! Located at 1372-1374.5 Edgecliffe Drive, these modern Silver Lake homes are not far from Sunset Blvd but far enough up the hill to provide some nice views and great natural light. All of the homes are 3 bedrooms 2.5 bath with about 1,600 square feet of livings and have their own attached 2-car garages. The homes have custom cabinetry and built in closets, Bosch stainless steel appliances and roof decks offering panoramic view of the Silver Lake and Hollywood Hills. Currently listed by Deasy/Penner&Partners, these 4 homes are priced from $745 - $795, 000 and one is already in escrow so if this sounds like something you’d be interested in, give me a call at 213-215-4758 and we can check them out together. What is the Small Lot Subdivision Ordinance? 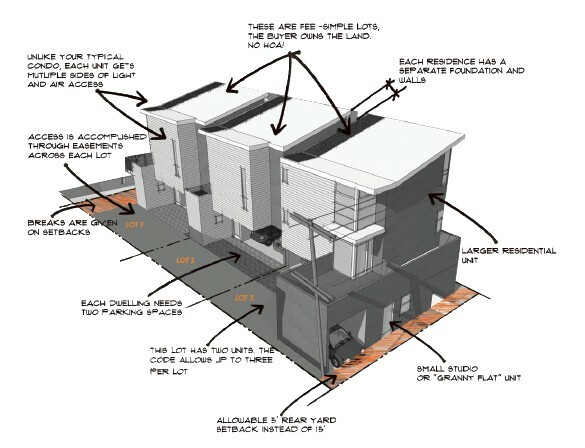 Los Angeles passed the Small Lot Subdivision ordinance in 2005, allowing developers to subdivide multifamily lots into smaller parcels and build individual homes on them. The new homes have smaller lots than traditional single family homes so if you are looking for a big back yard for Fido and the kids, this is not the right property for you. They are similar to townhomes as the normally have garages beneath and are 2-3 stories in order to get enough living space. The homes are not connected to each other and have generally have no home owner association dues. If you buy one, you own the building and the land beneath them, which is what really makes them different than condos. I'm curious if you would have done anything differently with the staging of these units.